After 33 years of presenting Festival Miami, a month-long series of concerts, the Frost School of Music has replaced it with an expanded offering of music, from September through April, with the launch of Frost Music Live! This new series is a celebration of music presented by the highly-acclaimed Frost School of Music at the University of Miami. “We are thrilled to launch this new series where audiences can rediscover great masterworks, explore the best in jazz and contemporary music, enjoy the brilliance of our students and faculty, and gain new insights into the musical creative process through informative musicology lectures,” says Shelton G. Berg, Dean of the Frost School of Music. Frost Music Live! 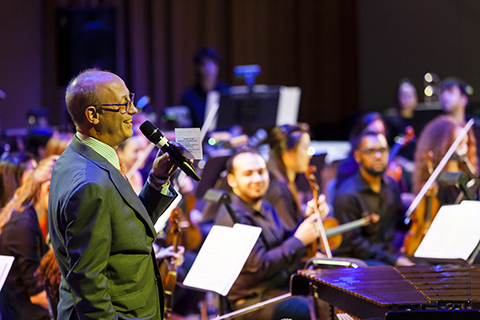 is as diverse as the Frost School, with distinctive programming that reflects the unique culture and varied tastes of Miami; with three distinct themes – Frost Music Classics, Frost Jazz, Pop, and Beyond, and Frost Faculty Recitals. At Frost Music Live! concertgoers will enjoy the world-class talents of award-winning Frost student ensembles, esteemed Frost faculty artists, as well as world-renowned guest artists and musicologists throughout the academic school year. Frost Music Live's mission to uphold the Frost School of Music’s vision of providing high quality music education and training for its students as well as exposing the community to a diverse range of cultures through music. Located in the heart of Miami’s culturally diverse community, the Frost School of Music intends to foster advancements in music performance, creativity, scholarship, and teaching among its faculty and staff. Frost Music Live acts as an important educational tool to amplify the number of opportunities for musical enjoyment and personal enrichment to as many residents and tourists as possible. It is known for three distinct programming elements: presenting international musical guest artists; showcasing Frost School artist-faculty and award-winning student ensembles; and adding educational components such as master classes, open rehearsals, and talks with the artists. Frost Music Live's superior and diverse musical programming expands beyond South Florida’s cultural boundaries. Frost Music Live caters to a wide range of musical tastes—from classical piano to children’s concerts to oldies music to jazz to Afro-Cuban music to chamber music to new works and everything in between. As always, Frost Music Live’s goal is to provide high-quality music performances at affordable prices so that people throughout the community can attend.